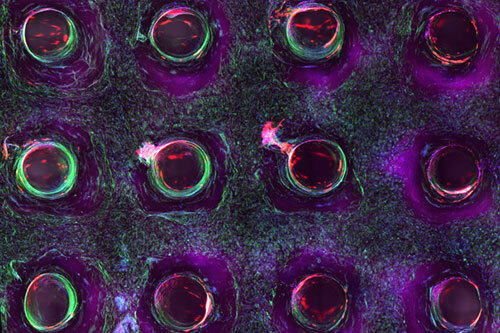 (Nanowerk News) A team at the Wyss Institute for Biologically Inspired Engineering at Harvard University and the Harvard John A. Paulson School for Engineering and Applied Sciences (SEAS) has invented a method for 3D bioprinting thick vascularized tissue constructs composed of human stem cells, extracellular matrix, and circulatory channels lined with endothelial blood vessel cells. The resulting network of vasculature contained within these deep tissues enables fluids, nutrients and cell growth factors to be controllably perfused uniformly throughout the tissue. The advance is reported March 7 in the journal Proceedings of the National Academy of Sciences ("Three-dimensional bioprinting of thick vascularized tissues"). "Having the vasculature pre-fabricated within the tissue allows enhanced cell functionality at the deep core of the tissue, and gives us the ability to modulate those cell functions through the use of perfusable substances such as growth factors," said David Kolesky, a graduate researcher at the Wyss Institute and SEAS and one of the study’s first authors. "Jennifer and her team are shifting the paradigm in the field of tissue engineering based on their unique bioprinting approach," said Wyss Institute Founding Director Donald Ingber, M.D., Ph.D., who is also the Judah Folkman Professor of Vascular Biology at Harvard Medical School and the Vascular Biology program at Boston Children’s Hospital, and Professor of Bioengineering at SEAS. "Their ability to build living 3D vascularized tissues from the bottom-up provides a potential way to form macroscale functional tissue replacements that can be surgically connected to the body’s own blood vessels to provide immediate perfusion of these artificial tissues, and thus, greatly increase their likelihood of survival. This would overcome many of the problems that held back tissue engineering from clinical success in the past."